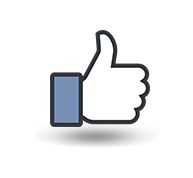 Our story begins in the early 1900's, with the Pucci family immigrating to the United States from Italy. In 1922, the Pucci's opened up the Cicero Macaroni Company to manufacture noodles of all different shapes and sizes for local restaurants and pasta sellers. Robert B. Strom purchased the factory in 1968, and many of the old world pasta-making techniques and recipes were passed down to him. In 1976, Strom created No Yolks®, the world's first no-cholesterol noodle. The idea for a no-cholesterol noodle came to him on his way to work as he listened to Arthur Godfrey on the radio talking about how eggs have 150 mg. of cholesterol. As a noodle and pasta maker, Strom knew that the standard 2 oz. serving of traditional egg noodles has 50 mg. of cholesterol compared to about 35 mg. in an 8 oz. glass of whole milk! Was it possible to make an egg noodle that was low in cholesterol? Thus, No Yolks noodles were born. Made from wheat flour, corn flour and egg whites, No Yolks noodles have no cholesterol. That's why No Yolks is the healthier alternative to regular egg noodles. And they cook up delicious, firm and fluffy, and stay that way in all your favorite recipes. 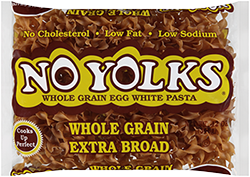 No Yolks is also the #1 selling noodle in both the US and Canada, and is the only noodle brand with national distribution. No Yolks is available in a wide variety of shapes and sizes to fit every recipe including: Extra Broad, Whole Grain Extra Broad, Broad, Fine, Dumplings and the European-style Kluski. No Yolks® is part of the Riviana Foods Inc. portfolio of pasta and rice brands. With pasta meal solutions for every taste and diet, we have something for your whole family. Enjoy the adventure and get creative! In addition to classic white pasta, we also produce: gluten-free pasta, organic pasta, whole wheat pasta, noodles, high fiber pasta, veggie pasta, ancient grains pasta and reduced calorie pasta. Our principal pasta brands include: American Beauty®, Creamette®, Light 'n Fluffy®, Mrs. Weiss®, Prince®, Ronzoni®, San Giorgio®, Skinner® and Wacky Mac®.